Several years ago I created a poster presentation for display at the 2012 American Orchestras Summit hosted at the University of Michigan. I’ve since shared my research privately, or within limited social spheres [read: Facebook], but have never shared my work with a wider public. My friend, Suby Raman, has recently gained some much warranted attention for his analyses of both the repertoire of the Metropolitan Opera and, more recently, gender in America’s top orchestras. Modern data graphics can do much more than simply substitute for small statistical tables. At their best, graphics are instruments for reasoning about quantitative information. “Instruments for reasoning” indeed. Repertoire has been on my mind since I began studying music within a University context. 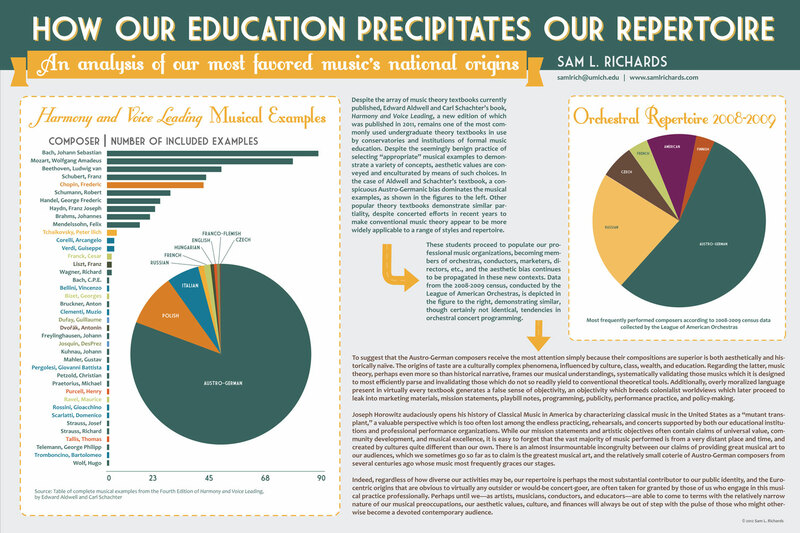 Although I, and virtually everyone else, within the discipline of academic music studies has some vague impressions in regards to the limited cultural, geographical, and chronological musics that are most frequently engaged in the classroom, my jaw dropped at just how limited it was only when I saw the data. I have witnessed others at conferences visibly stunned when presented with the following information, despite their expertise and even demonstrable erudition in music studies. “I had no idea it was that bad,” they’ve said. Self-rebuke and head shaking typically ensues. I am not necessarily proud of the depth of the following visualizations; in fact, they are, for the most part, simply standard pie graphs and bar charts, but they, nevertheless, demonstrate to the eye, and consequently the intellect, the significance of their underlying data. The epiphenomenal effects of artistic canonization and curation reach far beyond ostensibly benign choices of what we study or what we play. Curation unavoidably results in validation. In the classroom, the repertoire that is engaged is almost always accompanied by the implication that what is not being studied is, in fact, not worth studying. In performance, the repertoire that is frequently performed is almost always accompanied by the implication that what is not being performed is, in fact, not worth performing. As I continue to research how to ensure our art (and our studies of it!) exert contemporary relevance, repertoire, canonization, curation, and their effects are still very much on my mind. I have pasted the contents of the poster below. Click on the image near the bottom to see the information as it was originally presented on the poster. “Despite the array of music theory textbooks currently published, Edward Aldwell and Carl Schachter’s book, Harmony and Voice Leading, a new edition of which was published in 2011, remains one of the most commonly used undergraduate theory textbooks in use by conservatories and institutions of formal music education. Despite the seemingly benign practice of selecting “appropriate” musical examples to demonstrate a variety of concepts, aesthetic values are conveyed and enculturated by means of such choices. In the case of Aldwell and Schachter’s textbook, a conspicuous Austro-Germanic bias dominates the musical examples, as shown in the figures to the left. Other popular theory textbooks demonstrate similar partiality, despite concerted efforts in recent years to make conventional music theory appear to be more widely applicable to a range of styles and repertoire. These students proceed to populate our professional music organizations, becoming members of orchestras, conductors, marketers, directors, etc., and the aesthetic bias continues to be propagated in these new contexts. 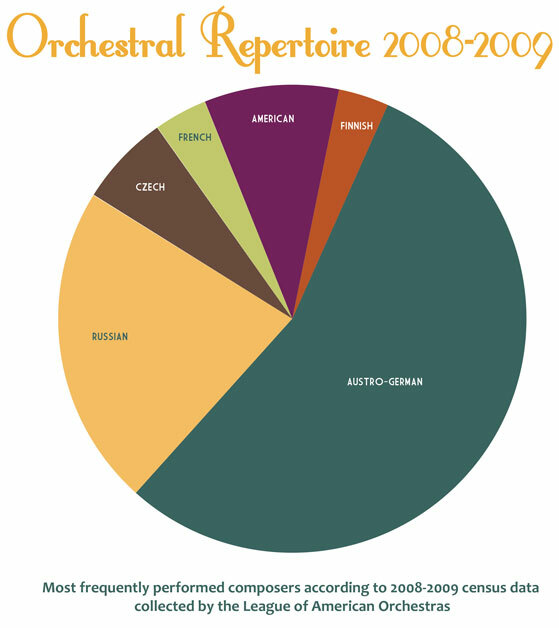 Data from the 2008-2009 census, conducted by the League of American Orchestras, is depicted in the figure to the right, demonstrating similar, though certainly not identical, tendencies in orchestral concert programming. 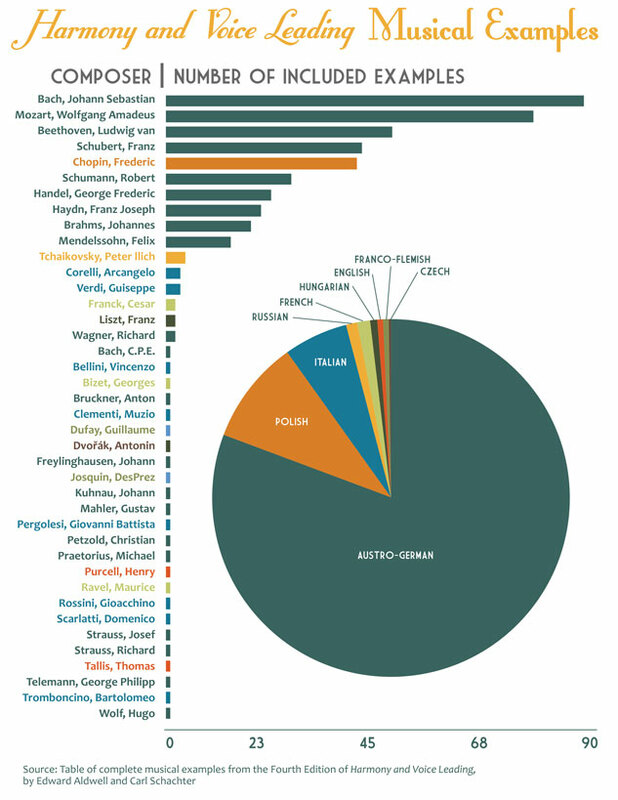 To suggest that the Austro-German composers receive the most attention simply because their compositions are superior is both aesthetically and historically naïve. The origins of taste are a culturally complex phenomena, influenced by culture, class, wealth, and education. Regarding the latter, music theory, perhaps even more so than historical narrative, frames our musical understandings, systematically validating those musics which it is designed to most efficiently parse and invalidating those which do not so readily yield to conventional theoretical tools. Additionally, overly moralized language present in virtually every textbook generates a false sense of objectivity, an objectivity which breeds colonialist worldviews which later proceed to leak into marketing materials, mission statements, playbill notes, programming, publicity, performance practice, and policy-making. Joseph Horowitz audaciously opens his history of Classical Music in America by characterizing classical music in the United States as a “mutant transplant,” a valuable perspective which is too often lost among the endless practicing, rehearsals, and concerts supported by both our educational institutions and professional performance organizations. While our mission statements and artistic objectives often contain claims of universal value, community development, and musical excellence, it is easy to forget that the vast majority of music performed is from a very distant place and time, and created by cultures quite different than our own. There is an almost insurmountable incongruity between our claims of providing great musical art to our audiences, which we sometimes go so far as to claim is the greatest musical art, and the relatively small coterie of Austro-German composers from several centuries ago whose music most frequently graces our stages. This Friday in the Dougherty Dance Theatre on the University of Oregon campus my work “with bated breath” will be featured along with choreography by Tiffany Alexandra Taylor. The work has been a collaborative process and has been a long time in the making, resulting in a 12-minute production—my longest collaborative choreographic work yet. One of my recent collaborations with choreographer, Valerie Ifill, and her newly forged company, IfillDance, will be featured later this month at Dance For A Reason, slated to be at the Hult Center for the Performing Arts’ Silva Concert Hall on January 23rd. In 1992, Geni Morrow had a vision of dancing up a storm of support for organizations that benefit our community. A brainchild of Geni Morrow, the first DFAR was staged in the auditorium of Agate Hall on the University of Oregon campus in 1993. Geni had reached out to a vast network of dancers, asking them to give their time and expertise to create an eclectic dance extravaganza. All profits were donated to St. Vincent de Paul, the first of many non-profit community organizations to benefit from this volunteer effort. The audience and the dancers for that first performance both numbered about 100 each! As it gained momentum over the years, DFAR moved to Lane Community College. When even two shows on consecutive nights could not hold the enthusiastic crowd, DFAR moved to the Hult Center for Performing Arts. In 2005, it made its debut in the Silva Concert Hall to an audience of over 1800. Dance for a Reason is Eugene’s most eclectic, energized and fun dance show! The annual dance performance and benefit showcases the variety of talented dancers, choreographers and movement specialists in our area. It also provides a financial boost to one of the many nonprofit groups working in our community. This year’s Beneficiary is Greenhill Humane Society. Indeed. It should be a fantastic show, presented for the benefit of a good cause. A brief snippet of my music, Tangential, is featured below, as well as further details about the show. In light of the pervasive yet productive insanity I’ve endured over the past few months, I wanted to give a belated shout out of thanks to all those who participated and played in my Master’s Recital last month. Over the course of the next few days I will be going though my site updating recordings with the most recent versions and performances. And dress, cool as the air, fresh as the light. Above the fishy flowing spring. Cobalt, through the standing brush and watercress. And we have caused the dawn. ECCE’s Fall 2009 Concert in Beall Hall on Nov. 23rd, was equally successful. With only four, but potent pieces on the program (James Kallembach’s Two Movements for Cello and Piano, Makia Matsumura’s Hourglass for string quartet, Heather Figi’s Speak, and Mark Knippel’s Do I Really Have To Wait Until I’m Dead . . .) I believe the concert to be one of ECCE’s most successful showings of chamber music to date. In March of 2010 ECCE will be featuring Grayson Fiske as soloist in William Kraft’s Concerto for Timpani and Orchestra, . . . among other things 🙂 Many more details to come.